Agile eXporter meets all of your document exporting needs. 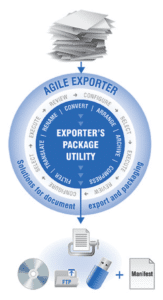 We designed Agile eXporter as a plug-and-play capability that makes it easy and cost effective to deliver large set of documents in specific delivery formats. Rather than placing documents into a flat, unorganized file, users can specify the configuration for an entire list of documents. Agile eXporter automatically downloads and repackages documents so you can process thousands of documents from hundreds of business objects. Agile eXporter connects to a repository then retrieves and organizes requested documents based on the document or business object list and instructions in the file. The final output package is a set of files and directories that contain the documents in a customized structure and meet the exact business requirements. Export, scrub and package multiple loans for investor review. Users can also prepare and deliver documents in MISMO format for FHA insurance review and approval. Select only the documents that need legal review, convert to PDF and deliver in a password-protected zip archive. Package and deliver active portfolio documents to customers to start a new account. Agile eXporter automatically updates document properties to match the new account standard. Group patient medical records and safely and securely place them on a CD or DVD for the patient or other healthcare providers in accordance with HIPAA regulations. Extract and package required claims forms and accident reports. Users can convert all documents to PDF format to prevent modification.